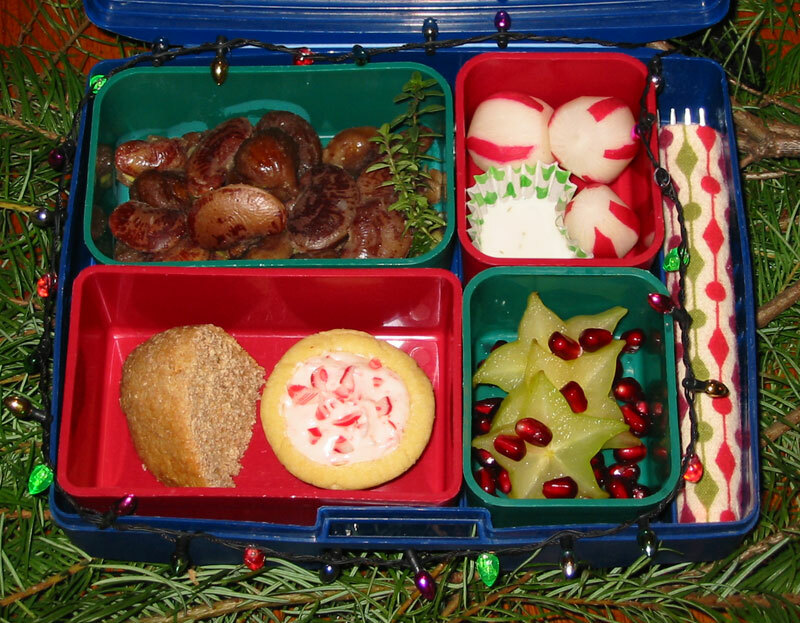 I know it's not a lunch, but I wanted to share a picture of the vegan Christmas Goodies we're giving out as a gift to neighbors, family, and friends this year. First, thank Isa's new book for telling us all about Kopper's Chocolate Lentils. That's right -- vegan "M&Ms"! (Can you believe it?? They really do exist!) I made up a batch of Back-to-School Chocolate Chip Cookies (page 24 in Vegan Lunch Box) and added some plain "chocolate lentils" for candy coated crunchy cookie goodness. 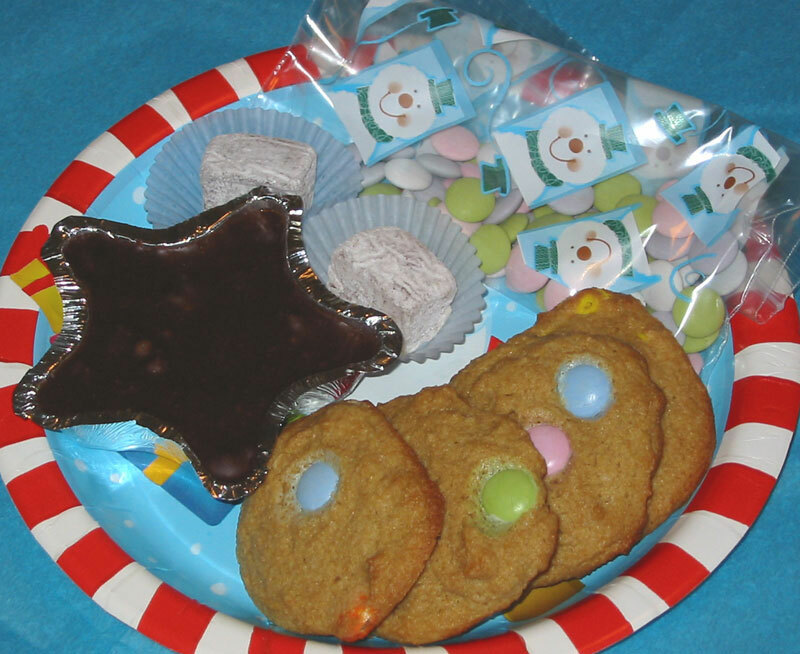 Next to the cookies is a little fudge star. Someone commented a few months ago that the chocolate icing I used for my Graduation Hats and Lamingtons turns into yummy fudge when refrigerated, so I decided to take that basic recipe and turn it into this recipe for Vegan Fudge. Next to the fudge are two Berry Delights, a kind of jellied candy made with fruit and nuts and rolled in powdered sugar. And to add to all the sugary delight, there's a happy snowman bag filled with more chocolate lentils, this time mint flavored. Happy Holidays! Shmoo's final lunchbox before winter vacation features some very merry Christmas Limas with Chestnuts and Brussels Sprouts. Christmas Lima Beans pair beautifully with the traditional mix of sweet chestnuts and Brussels Sprouts. The Brussels sprouts are finely shredded and almost disappear into the dish -- a nice way to get sneaky with those sprouts if your family doesn't take to them whole. Below the Christmas Limas is a bit of wholewheat roll and a Peppermint Candy Tart (I veganized the recipe by substituting 3 tablespoons soft silken tofu for the egg, and Earth Balance and soymilk for the butter and milk). Speaking of peppermints, I trimmed some radishes to look like peppermints and packed them with a bit of Vegenaise mixed with lemon and dill for dipping. Finally, sliced starfruit and fresh pomegranate seeds look very festive together. Verdict: The sweet lima beans were a big hit -- a great dish to bring to a holiday dinner or potluck. The tarts tasted like sugar cookies topped with peppermint frosting -- yum! The pomegranate seeds stained the starfruit a bit in the lunchbox, but what a lovely combination it made, all the same. 4 ho-ho-hos! The other day I showed my son a bit of plastic grass I had saved from a sushi restaurant. "You could use that in my lunch!" he exclaimed. "My lunch could be...a tiger hiding in the grass! Could you do that?" It shows how much I've learned about packing lunches in the past year and a half; I only had to think for a brief moment before responding with confidence. "Sure I can!" I shaped a slice of firm tofu into a tiger's head, then fried it in a bit of oil until it turned golden brown. 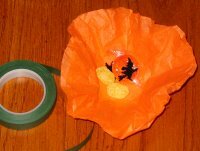 The tiger stripes are bits of nori seaweed cut with scissors; the face is more nori cut out with a "happy face" paper punch. The tiger sits on a bed of rice, and up above you can see a plastic squirting fish filled with soy sauce (from BentoTV). 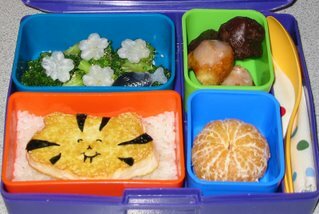 Also above the tiger is a serving of Burokkori No Goma Ae -- Broccoli Salad with Sesame Dressing -- from Japanese Vegetarian Cooking. This cold salad is a nice way to pack broccoli in the lunch box. 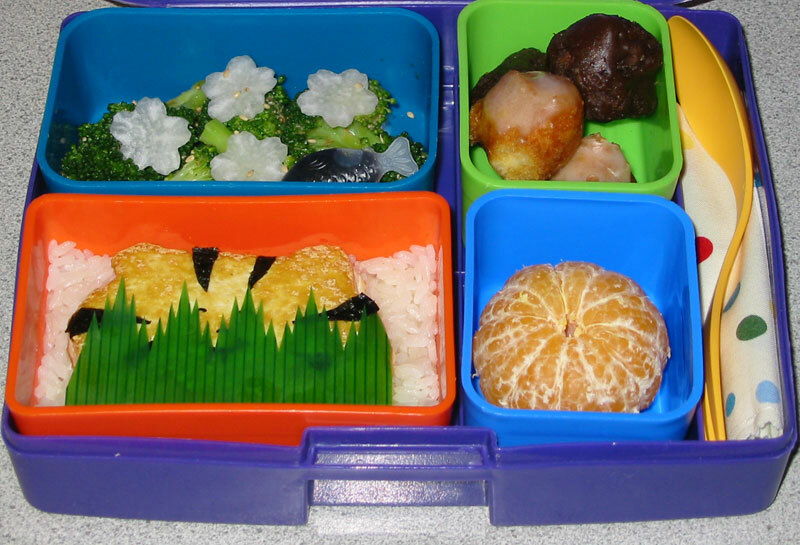 The little flowers are made from thin slices of daikon. On the side are four vegan donut holes -- two chocolate and two white glazed -- and a peeled Clementine mandarin. Verdict: Very obento today! Shmoo was thrilled with the tiger and the squirting fish. He liked the broccoli but wouldn't touch the daikon (they were cute, anyway!). Of course he loved the donut holes and the sweet, seedless mandarin. 5 stars. If you would like to pick up a copy of my book and give to an animal-friendly charity at the same time, check out the latest newsletter from Vegan Outreach. While supplies last, you can receive a free copy of VLB with your donation. Speaking of animal-friendly charities, you can also buy a copy through the PETA Catalog and have part of your money benefit People for the Ethical Treatment of Animals. Other resellers include Herbivore Store in Portland, OR; Cosmo's Vegan Shoppe; Lunch Matters in Australia; Three Little Figs in Boulder, CO; and Laptop Lunches (who are also featuring an interview with me in their latest newsletter). Finally, if none of those small, wonderful, independent resellers appeal, VLB is now available through that behemoth of ecommerce, Amazon.com. We listed it ourselves earlier this morning, in order to make all you Amazon Lovers happy (I, myself, admit to a bit of an amazon addiction; the "one click" button, she is dangerous). For those of you who are lucky (yes, lucky) enough to reside in eastern Washington state, I will be doing a Vegan Lunch Box Book Signing this Saturday, December 2nd, from 1:00pm to 3:00pm at the Kennewick Library (1620 S. Union St.). Come say hi, buy a copy of Vegan Lunch Box and have it signed in person. If that's not enough incentive to leave your cozy house and face the brutal Mid-Columbia cold, note that this book signing will be powered by FREE VEGAN DONUTS. That's right, we will be sampling some recipes from the cookbook along with a whole heap of vegan donuts and cookies from Nutrilicious Natural Bakery, who made me the happiest person in the world yesterday by sending us an entire box filled with vegan, donutty love. I found some charming little pasta shapes at my local grocery store and knew I wanted to feature them in something other than soup, where they tend to sink to the bottom and get lost. So I made up this Petite Pasta Salad, filled with big chunky pieces of cucumber, tomato, sugar snap peas, and olives and teeny weeny pasta stars. Shmoo usually doesn't like pasta salad; he says it is "too sour"; I think the amount of vinegar in most commercial dressings is too strong for his taste. So I took it easy and added just a touch of white vinegar mixed with white balsamic vinegar, which is mellower and sweeter. Next to the pasta are lightly blanched cauliflower and carrots with what surely must be the Fastest Dip in the West: toss a spoonful of Vegenaise with a squeeze of fresh lemon juice, a pinch of pepper, and a pinch of dried dill weed. Above the veggies are fresh kiwi fruit and Fuyu persimmon, a fruit we've been enjoying for the first time this fall. As a very special treat I also tucked in a Kidz Dream Orange Cream Smoothie. I never realized how nicely a juice box fits inside his lunch box. Verdict: Shmoo really likes these new soy smoothies and was excited to have a juice box in his lunch. He ate the vegetables with dip first and insists that this is the very best dip I've ever made. Gee, I wonder if I could simplify it even more and just pack him a scoop of Vegenaise! That stuff is so good! Shmoo grumped about having to pick bell pepper out of the pasta salad, which I had added to make my husband happy. I think shmoo is right; I've never gotten a taste for peppers, either. 4 stars. Save the turkeys! Here's a turkey-free feast in celebration of Thanksgiving. This year, instead of Tofurky, I made a large version of the Mini-Wellingtons recipe from Vegan Lunch Box. I made a small Wellington for this lunch, then formed the rest into a single large loaf wrapped in puff pastry and decorated with pastry leaves and berries. 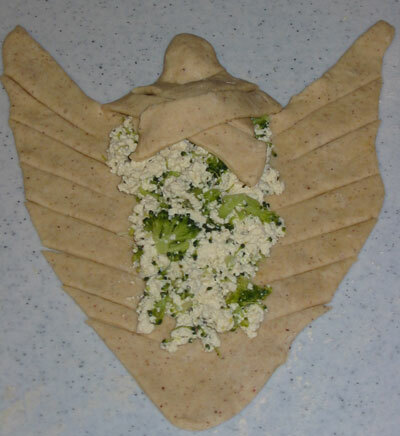 I'll be baking it for us and all our veggie relatives this Thursday (Hey, Mom! Hey, Zach! Hey, Rachel and gorgeous vegan Bambina! Be seeing you all soon!). I'll serve it along with some vegan gravy and mashed potatoes. To the right is a serving of Carmelized Squash and Apples: Peel a small butternut squash and two apples and cut into ½-inch cubes; toss with 3 tablespoons melted margarine, 2 tablespoons brown sugar, ½ teaspoon of kosher salt, and a grind or two of black pepper; roast at 400ºF for 20 minutes, or until tender. Above the squash is my vegan version of an old family favorite: Glorified Rice. 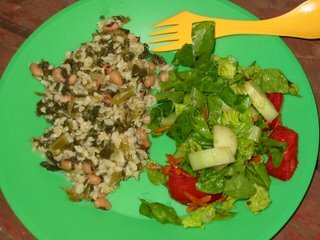 Follow the link for the recipe; I'm delighted that my vegan version came out so like the traditional dish. And finally, a green salad topped with dried cranberries and toasted pecans, with a little cranberry viniagrette on the side. Verdict: Glorified Rice and Wellington were both big hits. Squash isn't so bad when sweetened and eaten with bites of apples, but still is not a favorite. Shmoo is sad that he's going to have to share the big Wellington with all of us on Thanksgiving -- he wants it all to himself! 5 gobble- gobbles. 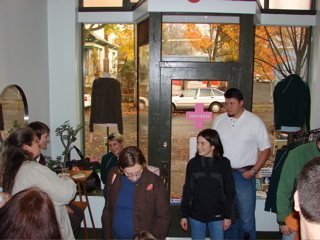 Here's a live-action shot of the Herbivore Store during my book signing last weekend. I had so much fun meeting and talking with everyone! Michelle and Josh are fantastic, and little Ruby the toddler-about-town is highly, highly adorable. 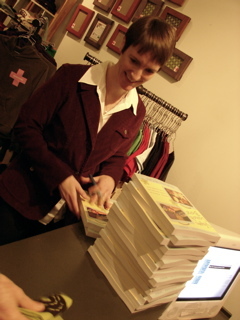 I also signed a handsome stack of extra books for the store after the event ended. So if you're in the Portland area, stop by the Herbivore Store and take one home! The podcast segment I recorded recently for Erik's Diner has been written down and is now a guest in Nava Atlas' Vegetarian Kitchen: Vegan Kids and Lunch at School: Helping your Child Fit In. While you're there, be sure to check out all the other great guest articles from a wide range of veg experts, as well as her wonderful collection of kid-friendly recipes. Speaking of kids, Vegan Outreach has just added a page featuring pictures and stories of Real Honest-to-Goodness Vegan Kids, in response to the worries that many have regarding raising healthy babies and children on a vegan diet. 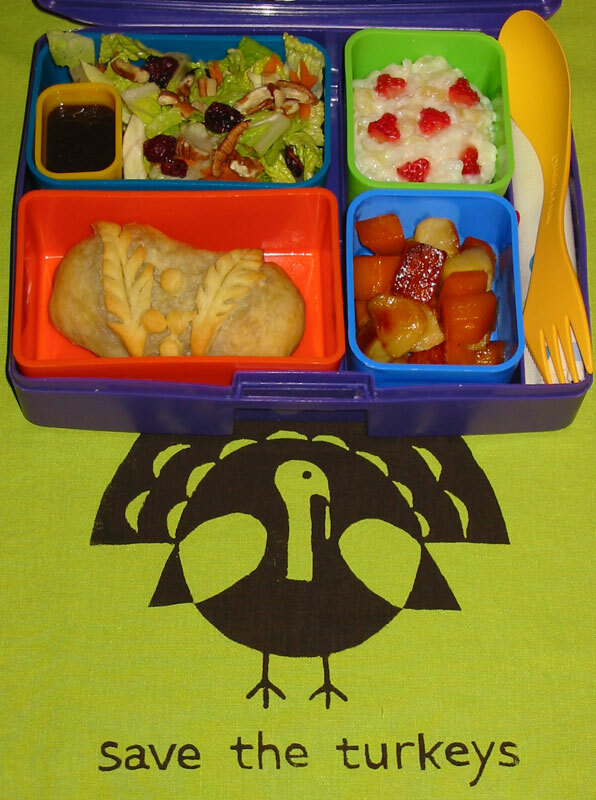 Next week I'll be posting a fun Thanksgiving lunch box. In the meantime, I hope you're all busy planning spectacular vegan feasts of your own! If you're looking for recipes, check out Nava's Thanksgiving Favorites and the Thanksgiving collection at VegCooking. And remember, it's never too late to Adopt-A-Turkey. 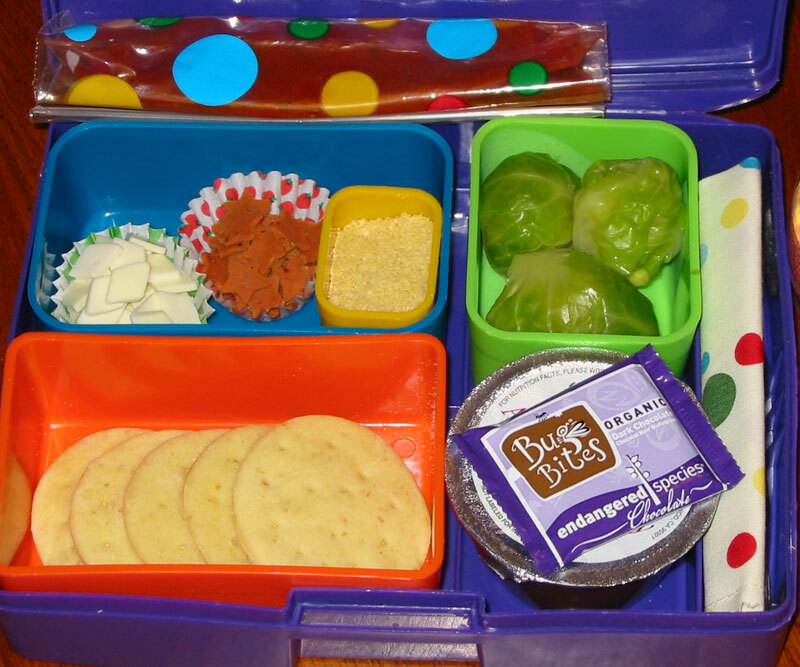 This year Pizza Lunchables seem to be The Big Thing everyone at school is eating; kids build their own little pizzas out of small, flat rounds of prebaked pizza crust, a squeeze tube of pizza sauce, shredded "cheese product" and "pepperoni flavored sausage". Then, they sprinkle their pizza creations with a special "Poppin' Packet" filled with what appear to be Pop Rocks. Wowee! Okay, so here's a veganized version: I made a batch of my Pizza Shop Breadstick dough (yes, from Vegan Lunch Box), shaping it into little rounds instead of sticks. I poked them full of holes before baking to avoid any big bubbles, then baked them on a parchment lined baking sheet at 375ºF for just 5 minutes or so. 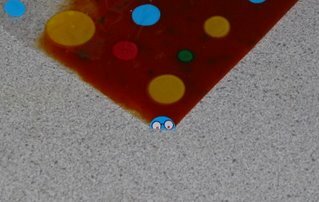 I filled a ziplock bag with tomato sauce, cut a very small hole in one corner, and sealed it with a little sticker. (The bag of sauce sits right on top of the pizza rounds when packing.) At lunch, peel back the sticker and squeeze out the sauce, then top the pizza with cut-outs of vegan cheese and pepperoni. Oh, and what about the "Poppin' Packet"? I draw the line at food that explodes in your mouth, but I did pack a little container of the same topping I use in my breadstick recipe -- a blend of yummy nutritional yeast and sesame seeds that we sprinkle on foods à la parmesan cheese. 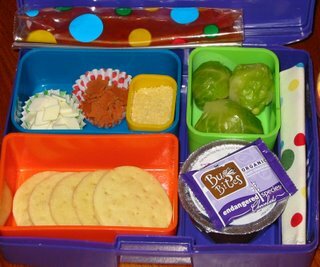 For the rest of lunch: three Brussels sprouts, a blackberry applesauce cup, and a dark chocolate Bug Bite. Verdict: The ziplock bag worked well, with no troubles getting the sticker off the cut corner and squeezing sauce out onto the pizza rounds. Making his own pizzas was messy but fun! Of course, he didn't notice the new polka-dot baggie with adorable matching polka-dot napkin. Some of these things I do just for me. 5 stars. We have been completely blown away by the hundreds of preorders for Vegan Lunch Box we are receiving! Thanks so much to all of you!! Although the "official" release date was set for November 15th, we decided to start shipping some of the orders early so the poor clerks at the post office wouldn't see us coming and lock the door. That means that a few hundred copies have already shipped and are now winging their way across America and around the world, on their way to you! And now the shmoo family is packed up as well, ready to ship ourselves off to Portland for a book signing tomorrow! Hope to see some of you there! Shmoo thinks this book business is a bore, but is very excited to check out the Star Wars exhibit at OMSI. The fine folks at Herbivore will also be hosting cupcake decorating and a "turkey-free tasting" that day, so everyone in the Portland area should come hang out with me and help them eat up the Field Roast. I used the recipe for Sweet Cornbread in Vegan Lunch Box and baked the batter in a corn cob muffin pan for about 25 minutes. I wrapped the sweet corn cobs in "husks" of freshly made corn tortillas from the local market. Above the corn is a mixture of lightly steamed baby squash, carrot "arrowheads", and sunflower seeds. Next to the veggies is a container of Anasazi and pinto beans. The tiniest container holds Prickly Pear Syrup. I also shaped a bit of cactus pad (nopale) into a decorative garnish. At lunchtime, the tortilla "husks" were used to scoop up flavorful beans, and the sweet cornbreads were dipped in the syrup for dessert. Verdict: The beans and tortillas were his favorite part. He took a bite out of each baby pattypan, but was disappointed that they they tasted the same as regular squash. Although the garnishes here were just for decoration, shmoo wondered what cactus tasted like, so I cooked the rest for dinner. I cut the pads into strips and boiled until tender, then rinsed well with cold water to remove the okra-ish slime. It tasted like green beans! 4 stars. 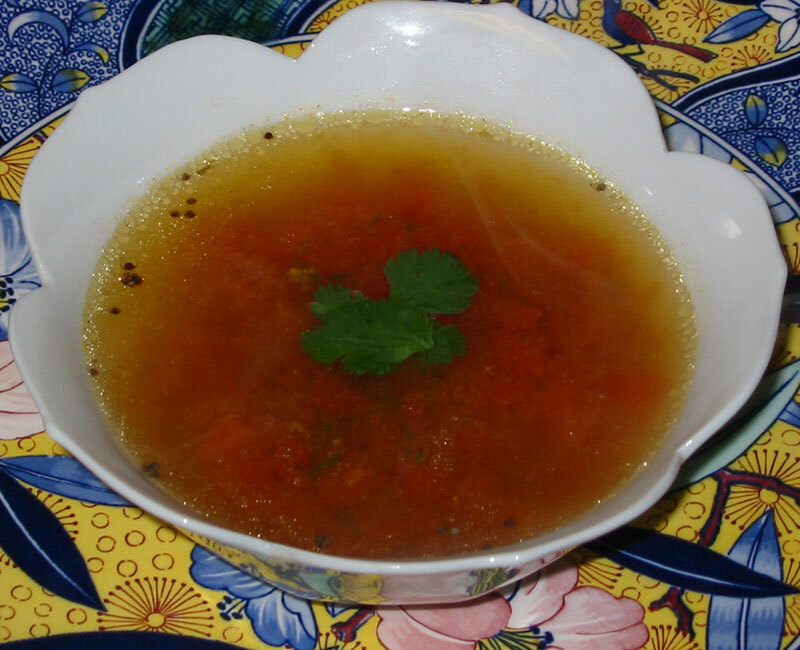 My last Home Sick Soup post featured hot, soothing Tomato Rasam, a quick and spicy Indian soup just right for a day stuck at home with the sniffles. Today I made another favorite Sick Day Soup of mine, Dr. Fuhrman's Famous Soup. I love the Big Production Number that is the making of this soup. I set aside an hour or two, pull out all the fancy equipment (a juicer and Vita-Mix or other strong blender are required) and whip up an absolutely enormous pot of the stuff. It freezes well, so you can have it on hand in case of emergencies. Speaking of emergencies, lately it seems that too many of the older people in our parish and family have been spending time in the hospital, dealing with surgeries, diabetes, high blood pressure, etc. Many of them are coming home feeling fragile, with small appetites and instructions to lower their fat, cholesterol, and sodium. I wanted to offer them something that was easy to eat and digest, and wouldn't do any harm by being high in salt or fat. 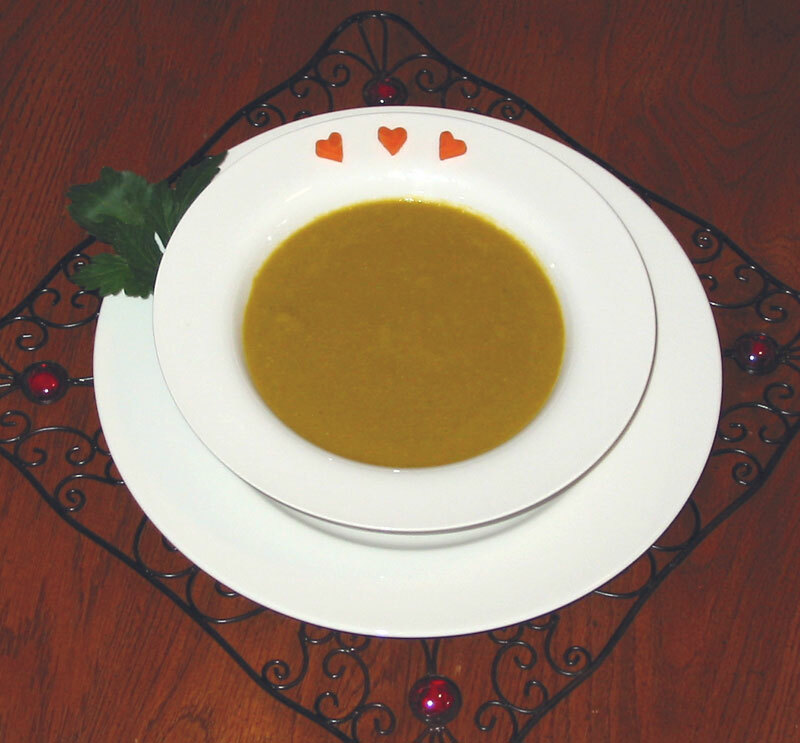 This soup is just the thing: creamy smooth, made with split peas and veggies cooked in fresh carrot and celery juice. The soup is easy to eat and flavorful enough that you don't miss the salt. It's great on its own for those with little appetite, or served with baked winter squash, steam-fried mushrooms, and fruit for dessert. Verdict: If you have a juicer, a blender, and a great, big, huuuge soup pot, this is the perfect potage to share with those who are feelin' poorly. The indomitable Erik Marcus asked if I would put together a little audio segment for his podcast this week, in celebration of the release of Vegan Lunch Box. I happily agreed! So bop on over and listen to the October 28th show, which includes my segment on vegan kids "fitting in" at school. For those of you haven't done so already, I urge you all to subscribe to Erik's Diner, and fill your iPod-shod ears with hearty helpings of vegan goodness. Shmoo is heading out on a science class field trip today. In celebration of the launch of my new Vegan Lunch Box cookbook, I've used three recipes from the book in this lunch -- one in a brand new way! I've even included page numbers, so you can all play along at home starting November 15th. First, Roasted Tomato Basil Soup (page 124) is packed in a thermos, topped with a chiffonade of basil (I love saying chiffonade). I wanted to serve the soup with some fall-themed crackers, so I used the barley poppyseed crust from my Savory Autumn Leaf Pies (page 243), rolled it thin and cut crackers out with tiny oak leaf and acorn cookie cutters. Sprinkle them with salt if you like, then bake on a parchment-lined baking sheet at 375ºF for about 12 minutes, or until golden. A salad of romaine, raddichio, and carrot is on the side (I'm still too freaked out to add his favorite baby spinach leaves), with a small container of Asian Miracle Dressing (page 159 and here). For dessert, Asian pear and raspberries mixed together, and one piece of our Halloween dark chocolate. Verdict: Shmoo tells me he's "addicted" to this hot, soothing soup (oh, and to lima beans). Once he starts eating it he just can't stop! A fantastic lunch, but we all agree that the chocolate is very bitter, and not as sweet as last year. 5 stars. P.S. Tune in Monday for a Halloween Lunch Box of the Damned (bwahahah). Finally, at long last, my new cookbook Vegan Lunch Box is ready for purchase! The books will be arriving at the beginning of November and orders will start shipping November 15th (just in time for the holidays, whew). Operators are standing by! If you preorder today at VeganLunchBox.com, your book will be lovingly packaged and delivered to the post office by none other than yours truly! Wait, there's more! Ordering direct will also get you free shipping on domestic U.S. orders (additional shipping costs apply to international and priority orders). By the way, if you would like to have your copy autographed, I can do that, too. Just write me a note in the "Other Instructions" box on your order form. 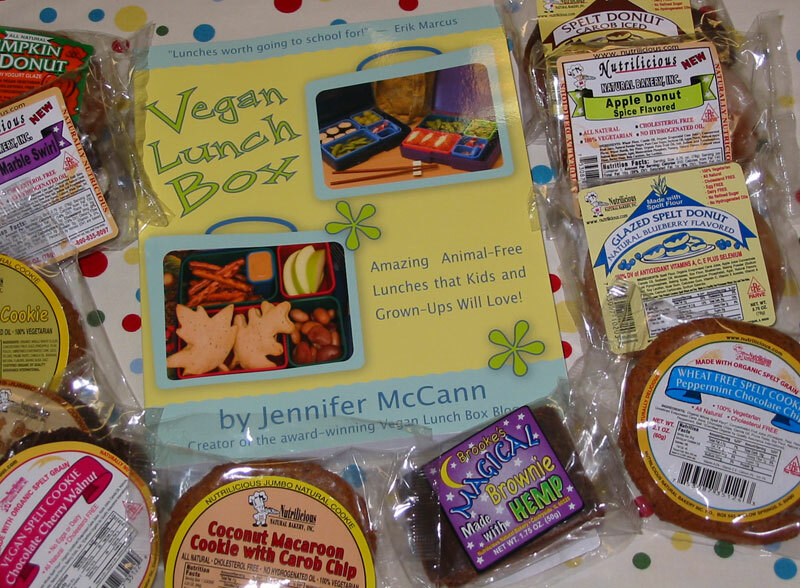 So go right here right now to order a copy or read more about what's in the Vegan Lunch Box. Woo! My son has always been an adventurous eater, willing and eager to try anything once. Unfortunately, he also has a very quick gag reflex. This does not a happy combination make. The first time shmoo tried pad thai was off his father's plate at a cozy little Thai restaurant. He asked for the noodle, placed it in his mouth, and promptly threw up all over the table. I was mortified beyond my wildest nightmares. I rushed him off to the bathroom while the waitress earned possibly the largest tip ever by clearing off the table. I knew right then and there that rice noodles were OUT. But this summer (four years later) shmoo told me he wanted to give rice noodles another try. With no small amount of trepidation, I placed some pad thai on his plate in the safety of our own home and ran for cover. Lo and behold, he loved it! 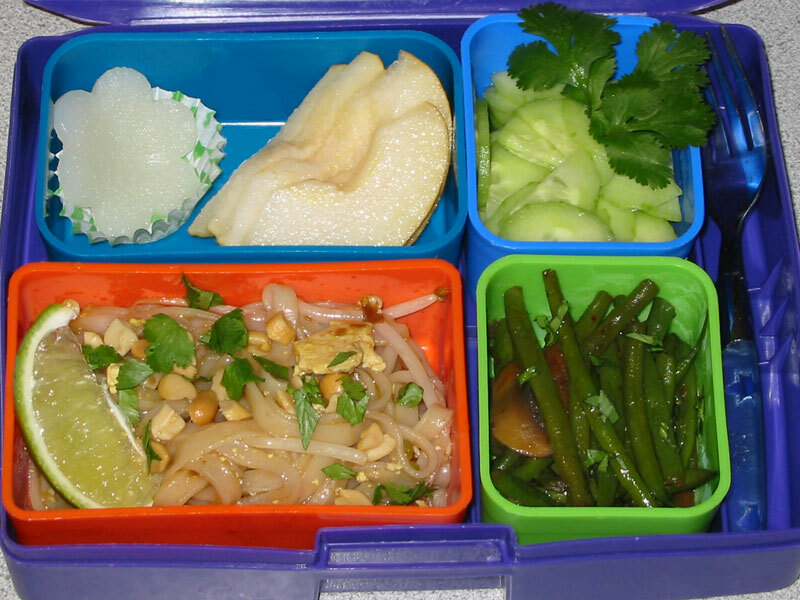 So, here's a vegan pad thai lunch to celebrate shmoo's new love of rice noodles. A Taste of Thai's Pad Thai For Two is vegan (hooray, no fish! ); I followed the recipe on the package, substituting crumbled tofu tossed in a bit of turmeric for the egg. I garnished it with fresh cilantro and a wedge of lime. On the side are three recipes from the vegan Thai cookbook Buddha's Table: Thai Feasting Vegetarian Style by Chat Mingkwan. First, Stir-fried Red Curry Green Beans with just a hint of red curry paste, made with mushrooms instead of tofu. Then a crisp, refreshing Cucumber Salad garnished with cilantro. For dessert, a wedge of Asian Pear sits alongside a very interesting little treat: a Thai Cupcake (kanom thuay). These traditional Thai sweets are made with coconut milk, rice flour, and sugar, steamed in small saucers until firm. They taste a bit like coconut-flavored gum drops! Verdict: It was -- dare I say it? -- Thai-riffic! Doh! 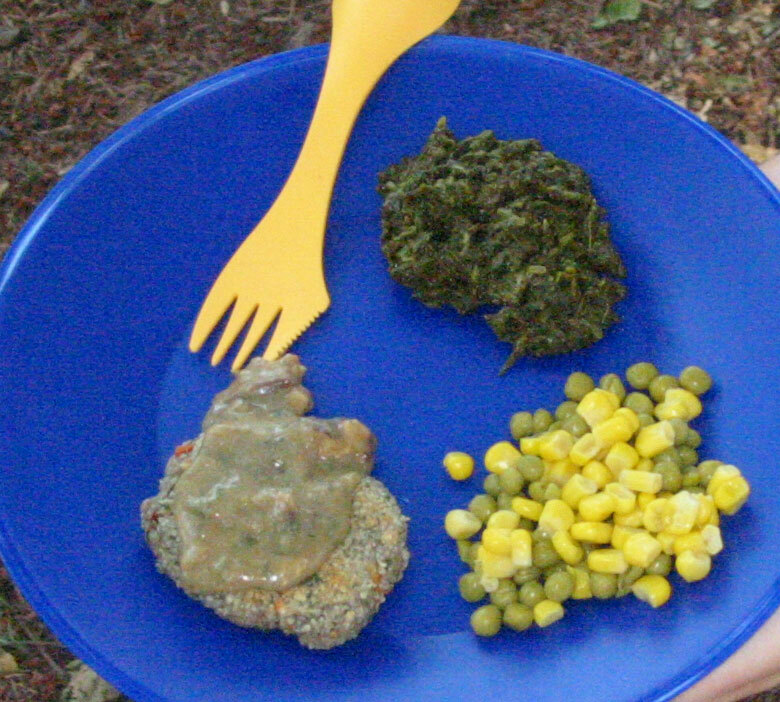 Shmoo's favorite part was the tender, spicy green beans (he picked out the mushrooms). 4 stars. Another Monday, another lunch box! 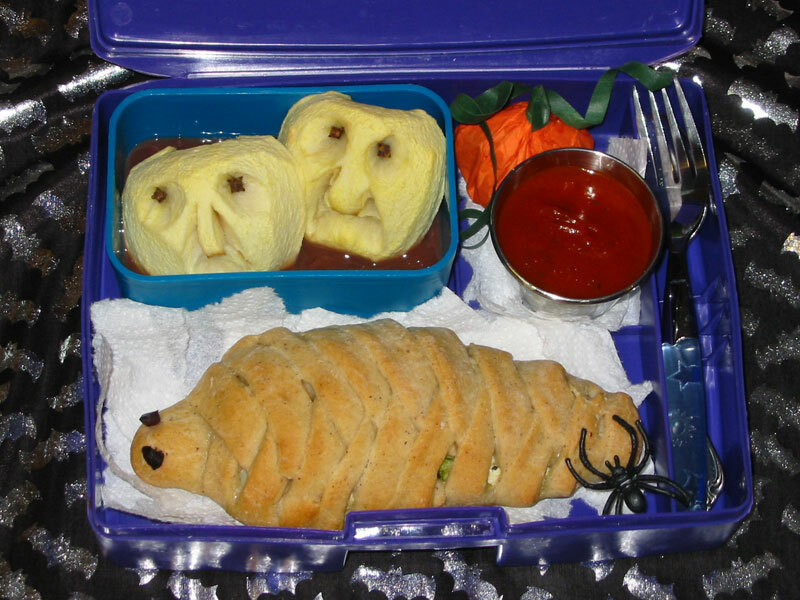 My friend Linda shared this lunch idea with me. 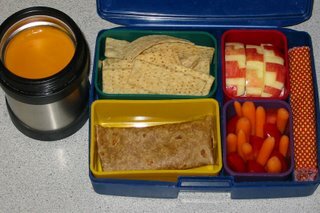 It's a menu that got five stars from her own little shmoo-ette: Nacho Cheese Dip made with nutritional yeast and pimentos, packed in a thermos with corn chips for dipping and a tortilla wrap filled with veggie chicken strips. I followed her lead but filled shmoo's whole wheat wrap with his favorite refried beans instead. On the side are baby carrots, garden-fresh tomatoes, and some apple slices with Aztec-inspired designs carved into the skin (we've been studying Mesoamerica this week). Verdict: This was by far the best nacho cheese we've ever had (including those made with dairy cheese! ), and one of the best uncheeses I've ever tasted. If we find out where her friend got the original recipe, I'll be linking to it here (UPDATE: follow the link on "Nacho Cheese Dip" above to go to the recipe and read about its origins). 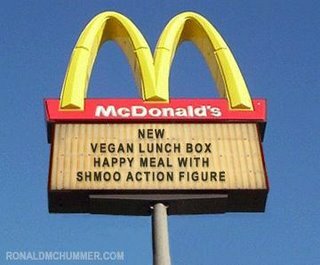 Shmoo was raving about this lunch! 5 stars. Thanks, Linda! 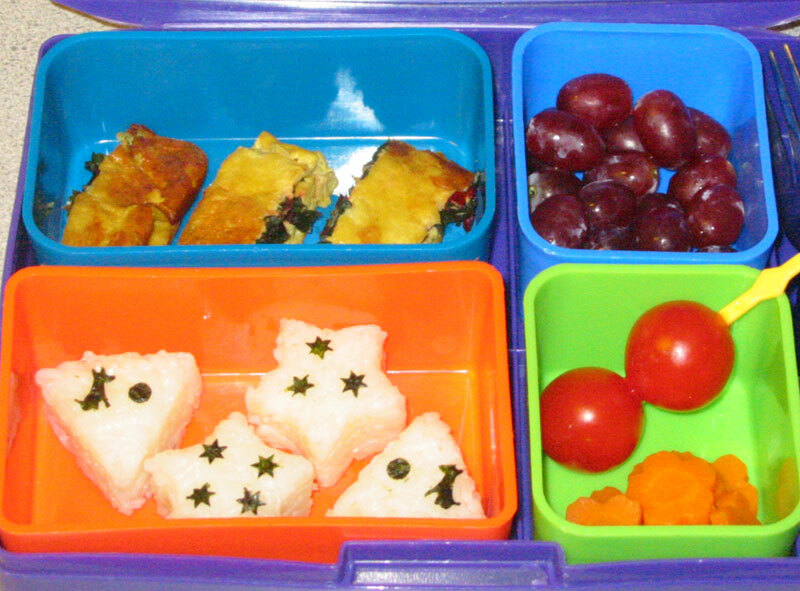 In my Japanese-inspired lunch box are rice shapes made with molds I picked up at the Bento TV shop. Regular paper punches are used to make these cute nori seaweed designs. Tamago yaki (Japanese omelet) is a common addition to the Japanese bento box, so I wanted a vegan version. I started with Bryanna's Tofu Omelet (scroll down), added soy sauce and sugar, and sprinkled the top with swiss chard that had been cooked, squeezed dry, and chopped (you could also use crumbled ajitsuke-nori, spring onions, or other cooked greens). I baked the omelets in small squares, let them cool, then carefully rolled and cut them. Verdict: Shmoo's favorite part of this lunch? The carrots, he said, were particularly tasty. He picked off the chard but liked the tofu tamago yaki, and now wants to know if he can eat every meal with a little platic toothpick. 4 stars. Here's a fun, easy lunch: cook jumbo pasta shells according to the package directions, rinse with cold water and drain well. Stuff with Toby's Lemon Dill Tofu Pâté (we tried Toby's for the first time this summer, and boy, is it fabulous). Garnish with a sprig of fresh dill. 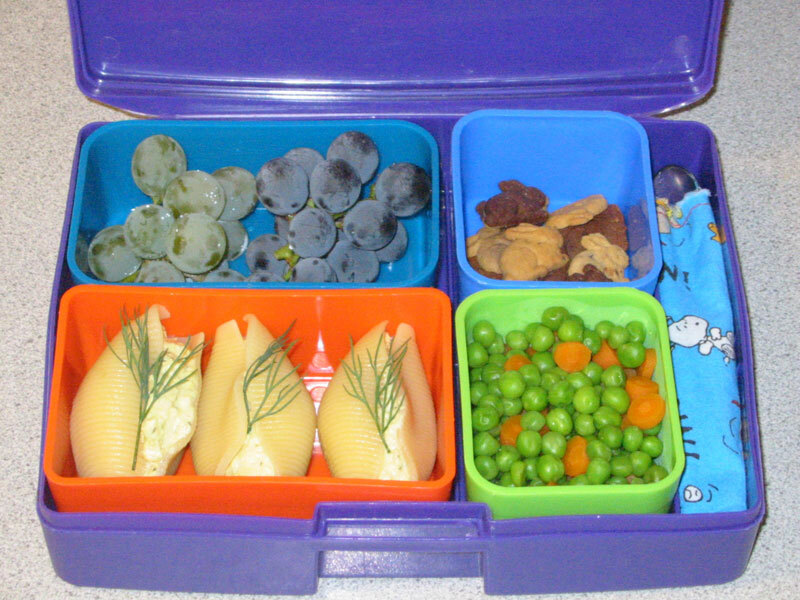 On the side is shmoo's all-time favorite lunch box veggie: peas and carrots. I cook chopped baby carrots until tender and add the frozen peas for the last minute or so. He loves these veggies cold and always eats them first. Above the shells are some of our very own home-grown organic Golden Muscat and Concord grapes. We'll be making the rest into juice this week. Finally, for dessert, a warren of chocolate chip and chocolate Bunny Grahams. Verdict: Stuffed jumbo shells make a great lunch, but be prepared: the filling tends to goosh out the back when you first take a bite. Three shells were the perfect serving size. Shmoo didn't finish all his grapes. Seeded grapes are much more fun to eat outside, he says, when you can spit them hither and yon. 4 stars. 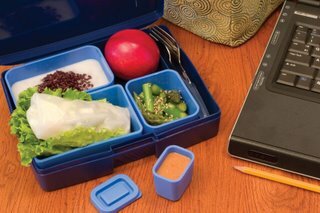 While Vegan Lunch Box ("The Book") is away at the printers (soon! very soon! ), I've been keeping myself busy inventing something new! 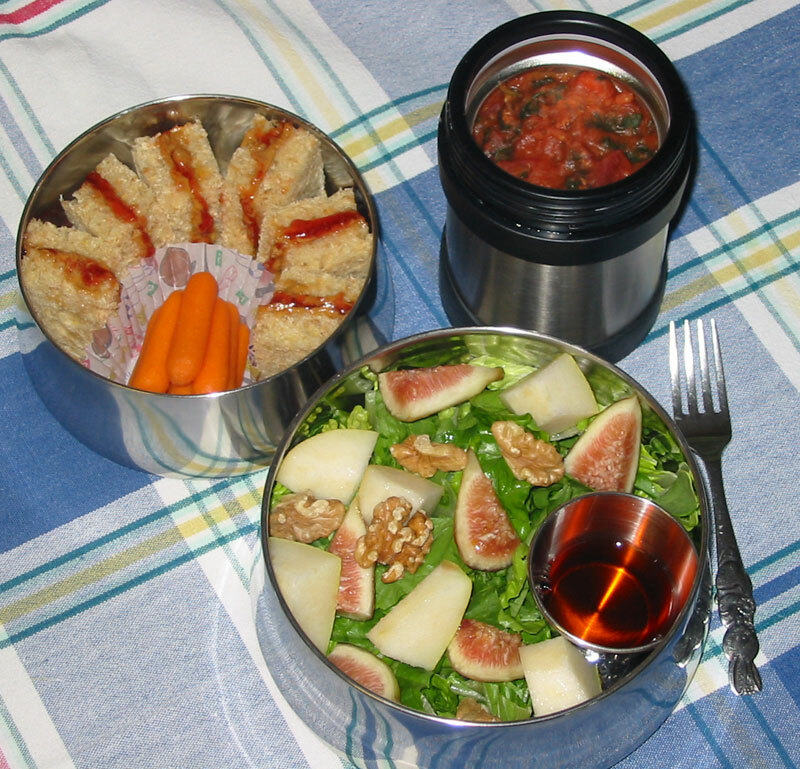 This summer I posted a series of picnics featuring my stainless steel food carrier. Although I love, love, love my carrier, several times I found myself walking out the door with lunch in hand but napkin and fork still on the kitchen counter. 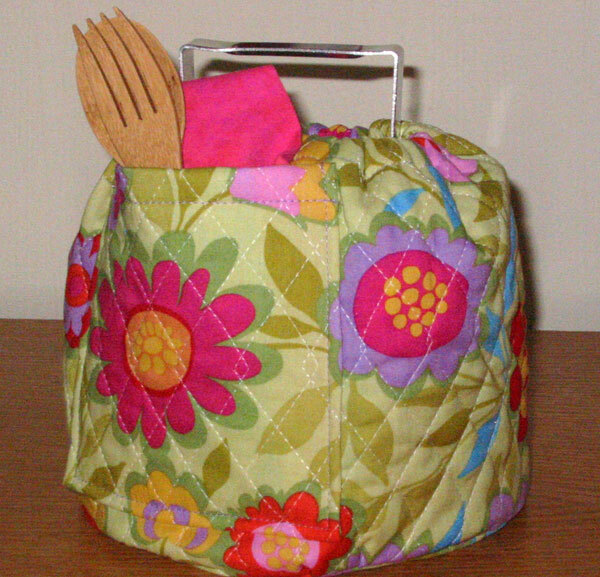 I dreamed of finding a way to attach my utensils to the tiffin so I wouldn't forget them. The quilted fabric cinches tight around the top but leaves the handle exposed for easy toting, and includes enough extra space around the food carrier to tuck in a small ice pack or a snack bar or two. 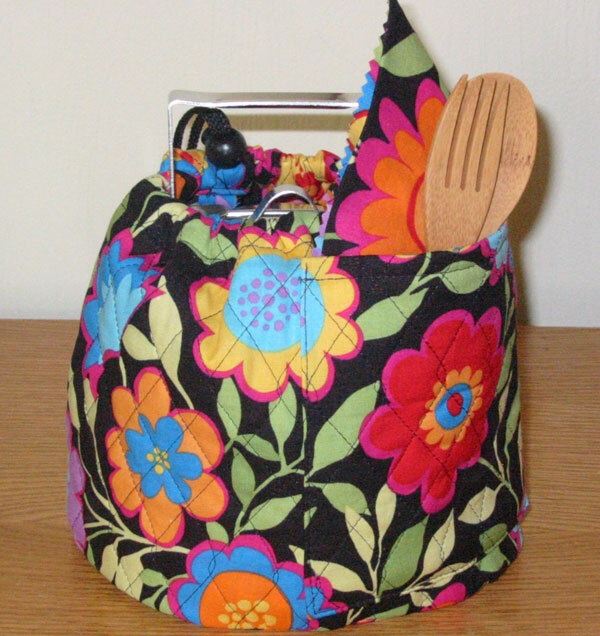 A pocket on the outside holds utensils and a snazzy matching napkin. 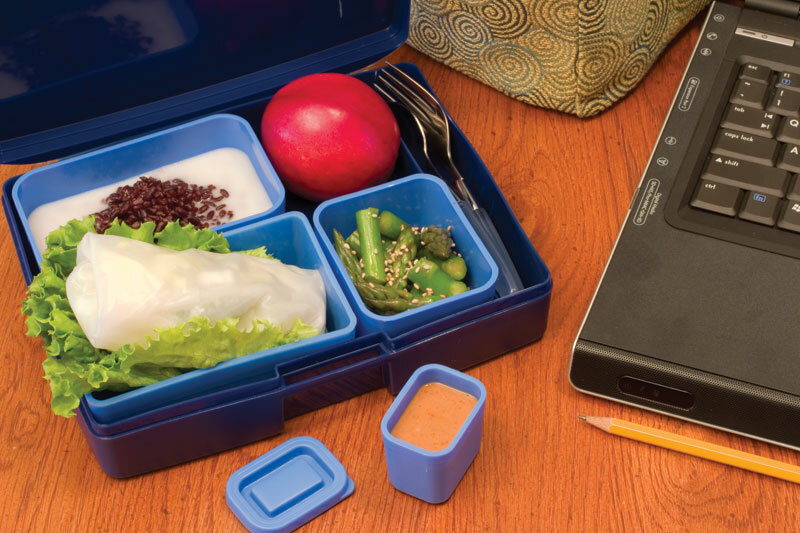 The hugger is not insulated enough to keep food cold all day, but with an ice pack it will keep lunch cool on the way to work or to the park. And it looks darn-tootin' adorable! 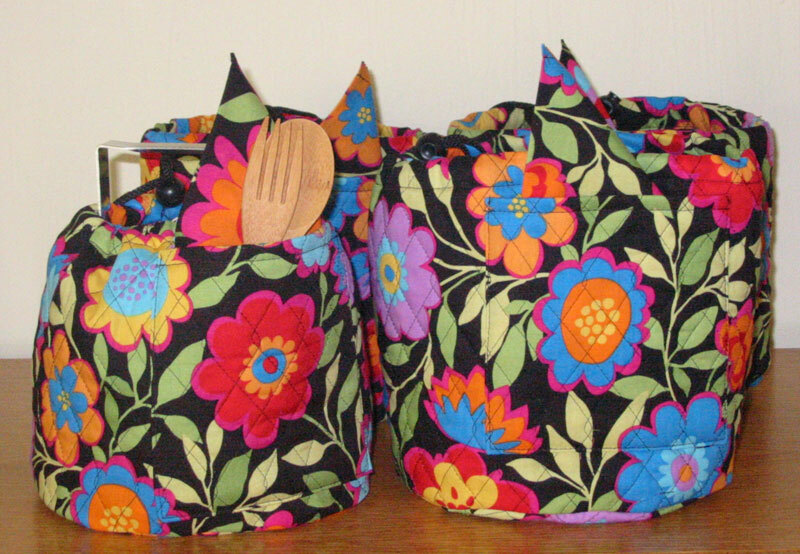 It was so much fun I didn't want to stop, so I made four black floral huggers with matching napkins, and three green floral huggers with hot pink napkins. I've decided to try selling them here for $14.00 each (such a bargain!). 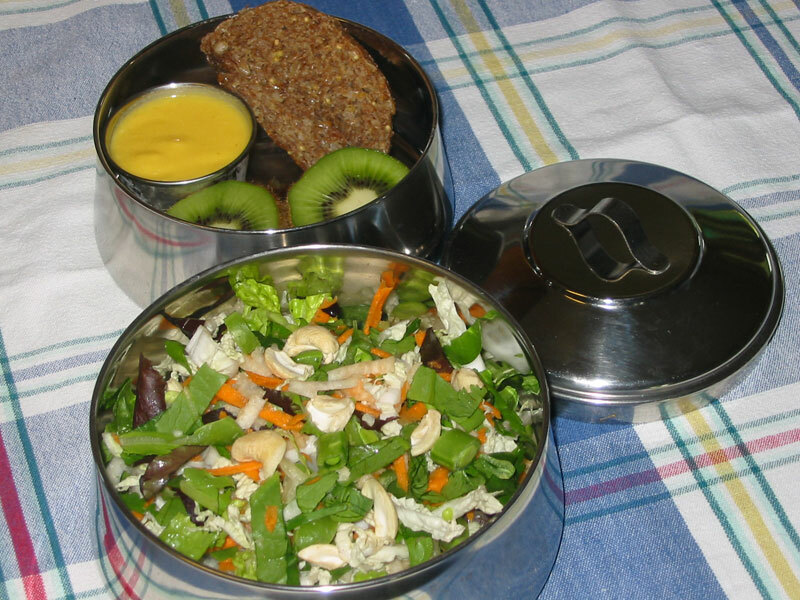 Each tiffin hugger will include a napkin and a little stainless steel ramekin with plastic lid (the same kind I use for dressing in lunches like this one). The stainless steel food carrier and bamboo utensils are not included; you'll have to visit To Go Ware to get those. Wow, thanks everyone! Tiffin Huggers will be heading out across America on Monday! Here's a lunch I created and photographed especially for the cookbook (which is on the way to the printers, eek!). A rice paper wrapper enfolds a mixture of gingery baked tofu, fresh apple slices, Napa cabbage, and cilantro. On the side is a small container of peanut sauce for dipping and some of my stepdad's Asian-style asparagus (he's thrilled that a recipe of his is actually going in the cookbook). 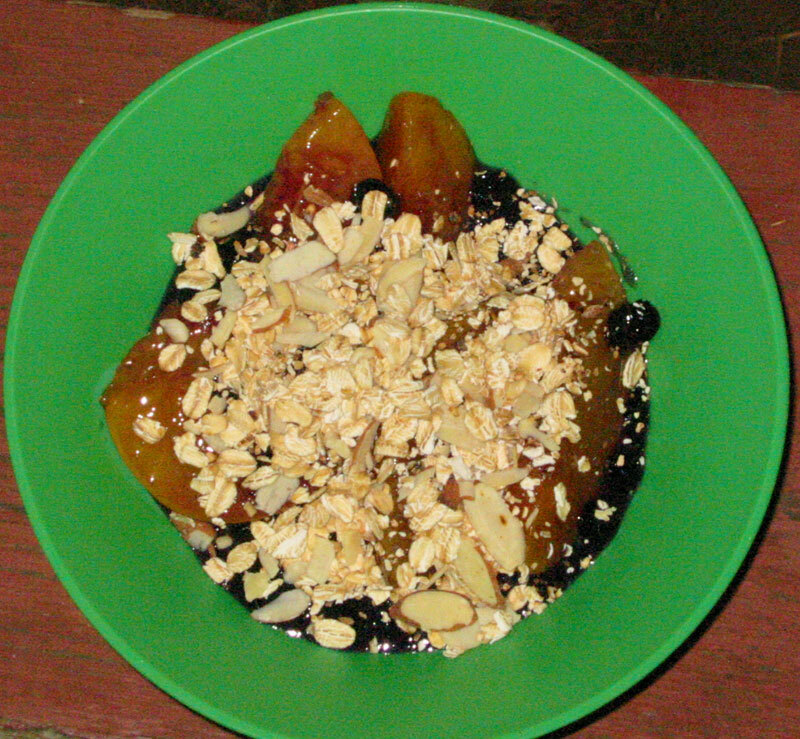 For dessert, a nectarine and a dish of luscious black rice pudding. This is our favorite treat when we eat at a local Thai restaurant -- chewy black rice topped with a mixture of sugar and coconut milk. Verdict: Big thumbs up from the photographer and testers -- my husband even said this spring roll was worth the cost of the entire book! Shmoo doesn't care for rice paper, so he stuck with tofu and apple slices and a big, piping bowl of black rice pudding. He says to pack the pudding in a thermos and eat it warm, but I think it's also nice at room temperature if you don't want the added weight of a thermos. 5 stars. Make your own sign at Ronald McHummer. 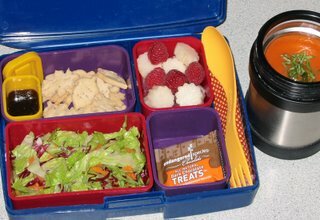 I’m glad to see that there are so many wonderful blogs are out there filling the gap left by our lack of lunches. 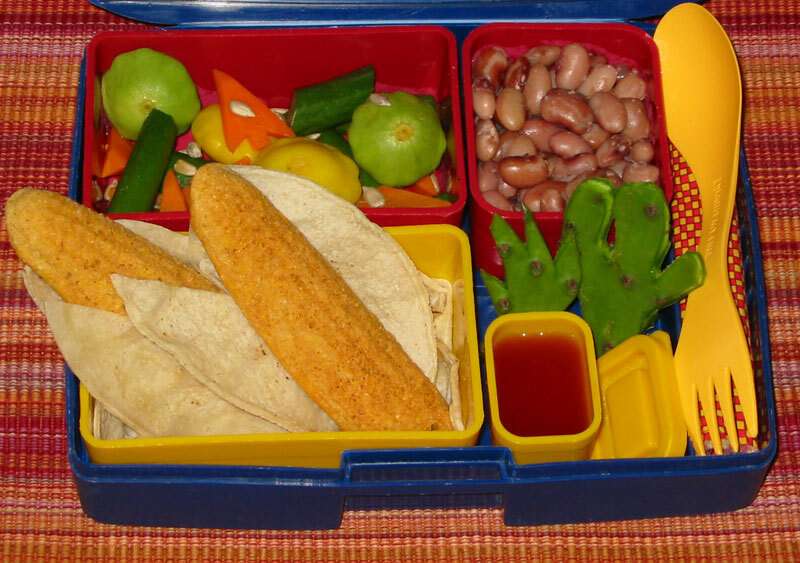 I'm especially inspired by the health-conscious mom over at Junk Food Lunch Box. Now there's a mom who understands that nothing says "I Love You" like high fructose corn syrup. Speaking of back-to-school, most of you have probably noticed that we have not. Gone back to school, that is. This year we’ve enrolled in a part-time program called "parent-teacher partnership". It's fabulous! I think he's learned more in the last two weeks than he did all last year. Although it cracks me up that I have regular meetings with my son's "learning consultant". Anyway, that means shmoo only packs lunch once a week. So far he’s been very enthusiastic about packing his own. It’s an interesting mish-mash of whatever he can put together by himself -- sandwiches, cold veggies, fruit, and soy yogurts. Yesterday he fried a pan of veggie bacon for a bacon sandwich, then ate it all for breakfast. He made a very squishy cashew-macadamia butter and strawberry jam sandwich instead. Vegan Lunch Box is being featured today on AOL's Diet & Fitness page as the "Daily Bite". Welcome, AOLers, and don't forget to check out the Archives for an entire year of vegan lunch boxes! "Pack a Lunch With Punch!" 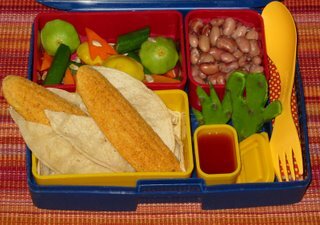 VegCooking.com has put together a great list of Veggielicious Lunchbox Dishes and other ideas for the back-to-school crowd. 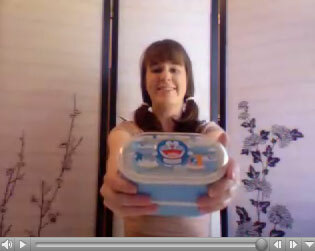 Oh, I think BentoTV is just about the cutest thing EVER. 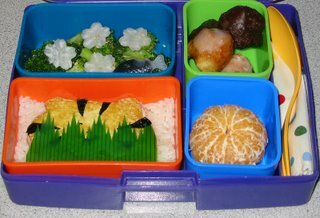 I want every little bento box, nori punch, and rice mold she carries. Here's our brave shmoo ready to hit the trail on another exciting outdoor adventure. Man, that kid can hike! If you're getting ready to head into the wilderness, too, check out the new article I wrote for kidscantravel.com: A Vegan Campfire. Special thanks to TsugaMensch for recommending the book Lipsmackin' Vegetarian Backpackin'. We're back from our big end-of-summer campout! Last year I relied heavily on meal packets from Mary Jane's Farm. Although I still love them, at around $7 a serving the price was looking a bit too steep. This year I decided to make my own camp tucker using dried or canned foods that wouldn't go bad without refrigeration. The first night we had the luxury of a fresh green salad from the still-cool cooler, along with a heap o' "High Water Hoppin' John" -- black-eyed peas, precooked brown rice, and a can of collard greens. This recipe was from the clever new cookbook Apocalypse Chow by well-known vegan chef Robin Robertson. 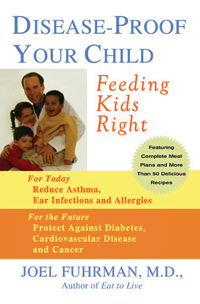 The book is a "guide to eating with elegance even when the refrigerator, stove, and microwave are rendered powerless", and it succeeds wonderfully; stock your pantry using these helpful lists and recipes and your family will stay happy and well-fed during the next natural disaster. The recipes rely heavily on canned foods, so it's perfect for car camping where weight isn't an issue. Speaking of canned food, I didn't want shmoo to miss out on the quintessential campfire "weenie roast" experience, so I brought along a can of Cedar Lake Deli-Franks. Canned veggie dogs frighten me, but shmoo jumped in with gusto and roasted them over the campfire, along with (of course) vegan marshmallows. He gave them both a big, sticky thumbs up! So what if food weight is an issue? If you're hauling everything into the back country, you're going to want to ditch the cans and find something more lightweight and portable. That's where my favorite camping cookbook of all time comes in: Simple Foods for the Pack. This friendly little book has dozens of easily veganized recipes. 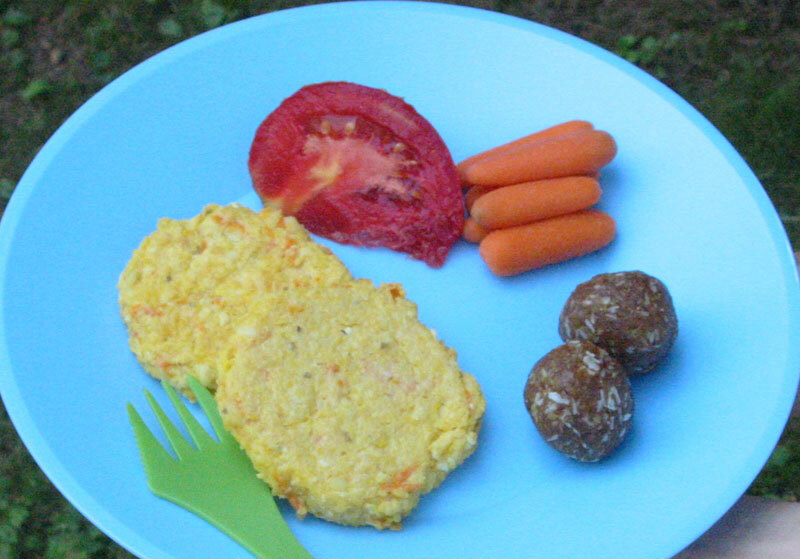 Pictured here are Polenta Cakes: sturdy, savory "journey cakes" made at home the night before the trip. These tasty mini-casseroles were filled with zucchini, carrots, tahini, and onion (shhh, don't tell shmoo). I would recommend them highly for the lunchbox. Ah, and those of you who are addicted to Larabars will be happy to note that this book includes an entire collection of "fudges" made from mashed dried fruits, dates, and nuts. Pictured here is Apricot Date Fudge, made from dried apricots, dates, walnuts, coconut, and a squeeze of lime. This was my husband's favorite campout treat. On our final night I made another dish from Simple Foods: Sunflower Seed Patties with Shiitake Mushroom Sauce (I left out the milk powder and added more vegetable broth powder to make it vegan). I was amazed that this dish fit easily into two small ziplock bags, weighed almost nothing, and made enough for three generous servings. I opened up some small cans of peas, corn, and spinach on the side. And finally, for dessert, here's a dish I created especially for our trip: Peach Blueberry Campout Crumble. I've wanted to work with dehydrated Just Blueberries for a long time, and I finally got my chance. The flavor was surprisingly fresh, and they plumped up with just a minute's cooking time. Yes, even Bobby Flay can provide inspiration for the vegan chef! His Chinese Chicken Salad is one of my favorite salads of all time: shredded Napa cabbage, sugar snap peas, cilantro, carrots, and peanuts with a zippy red chile peanut dressing. I veganize it by substituting agave for the honey and topping it with grilled tempeh instead of chicken. The flavors sing! Today, however, I tried topping the salad with cashews and Orange Cashew Dressing, basically because I had some in the fridge. I also packed a kiwi fruit (I like to slice them in half and scoop them out with a spoon) and one of my new favorite snacks: Millet Rice Manna Bread. Manna Bread is made entirely of sprouted wheat kernels, which are said to be easier to digest than regular wholewheat flour. The loaf is cakey, dense, and moist, excellent plain or topped with cashew butter. This fall, when it stops being hotter than blue blazes round here, I plan to bake my own. Verdict: I liked the cashews, but missed the more assertive peanut dressing. 4 stars. P.S. Yes, this was a little lunch just for me; shmoo is eight now, and has been really into cooking for himself these days (his specialty is smoothies). I'm happy to step back and let him choose his own meals; it's fun to watch him learning to cook, and I'm not about to give him a complex by jumping in to take pictures. Today Disease-Proof blog is reminding me that it's almost time for back-to-school with their post on Packing A Lunch For School. We're going to have to give that Hot Russian Dressing a try. 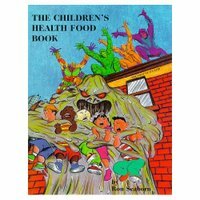 Recently I set out to find books my son and I could read together that would encourage healthy eating without requiring any dairy deprogramming afterwards (kids are always being told to drink lots of milk for "strong bones and teeth", with no mention of other sources of calcium). 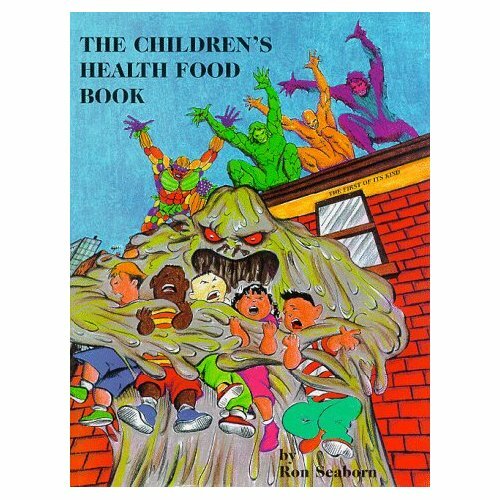 The first book we ordered, The Children's Health Food Book, sounded promising: superhero "Health Guardians" like "Vegetarian Warrior" and "Fruitarian Fighter" do battle against the evil "Meat Monster" and "Sugar Demon". Sounds perfect for an eight-year-old! But when we sat down together to read the book we both became...confused. What does the author mean by "mucus"? 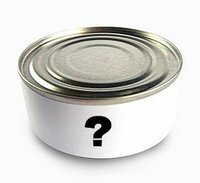 Is this some kind of raw food thing? Mucus, he says, causes all the adult diseases and all childhood illnesses like colds, flus, and asthma. Mucus comes from eating "thick gooey food" like meat, milk, sugar, and starch. I told shmoo my best guess was that the author was referring to atherosclerosis, but I really have no idea. My son's biggest complaint was the lack of story line; the book reads more like a lesson than the action-adventure he had been hoping for. 1 star. Next came The Race Against Junk Food, starring the S.N.A.K. 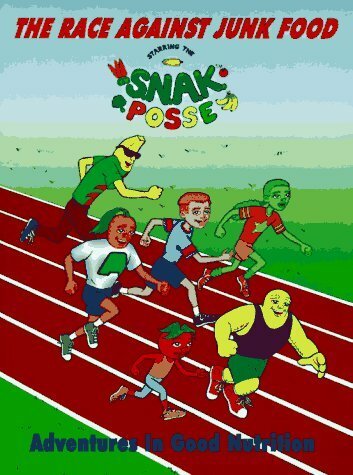 Posse ("Super Nutritionally Active Kids"). The message here is clear, straightforward, and universally acceptable: junk food and cigarettes are BAD; fruits, vegetables, and exercise are GOOD. The author uses an action-packed story to get the point across, combined with colorful, detailed illustrations (we loved all the exercising vegetables). Shmoo liked sitting down with this one; he carefully analyzed each picture and read the story several times on his own. I only wish a competent editor had helped with punctuation and sentence structure; better writing could have made this story easier to read. 4 stars. We're heading out for a little summer vacation today, and I'm too excited to sleep! So here I am at 4am preparing a few healthy snacks to take along. 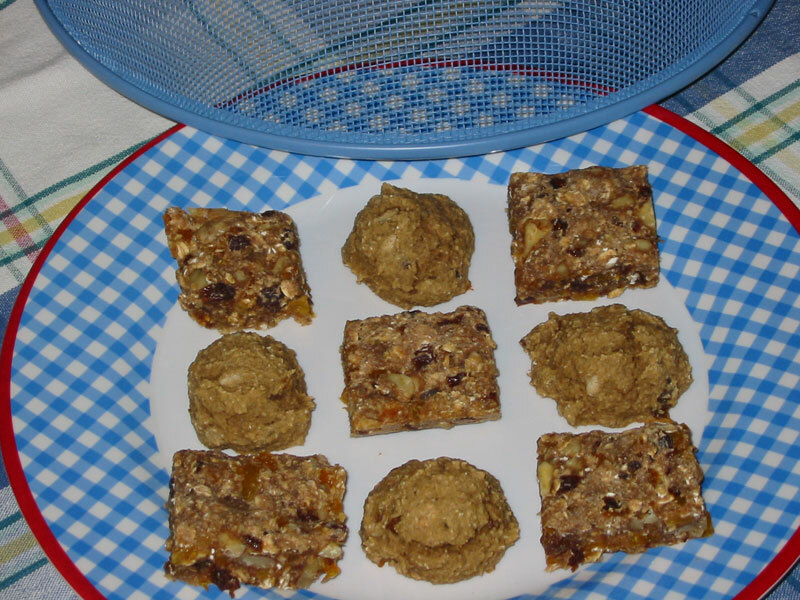 I've been working on creating healthy bars and cookies that shmoo will eat but that are also Eat To Live-friendly for me, meaning no white flour, sugar, oil, or salt. 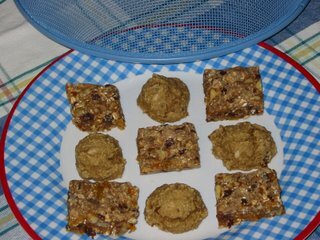 Here are our two favorites so far: Fruit & Nut Bars made with spelt, oats, raisins, apricots, and walnuts, and Banana Oatmeal Cookies, made with oats, bananas, sunflower seeds, and dates. We don't like to eat out more than once a day when we're on vacation (too many other things to see and do), so I'll be packing a big cooler with these cookies & bars, plus tons of fresh fruit, veggie sticks, hummus, sandwiches, crackers, juices, and a jar of almond butter. 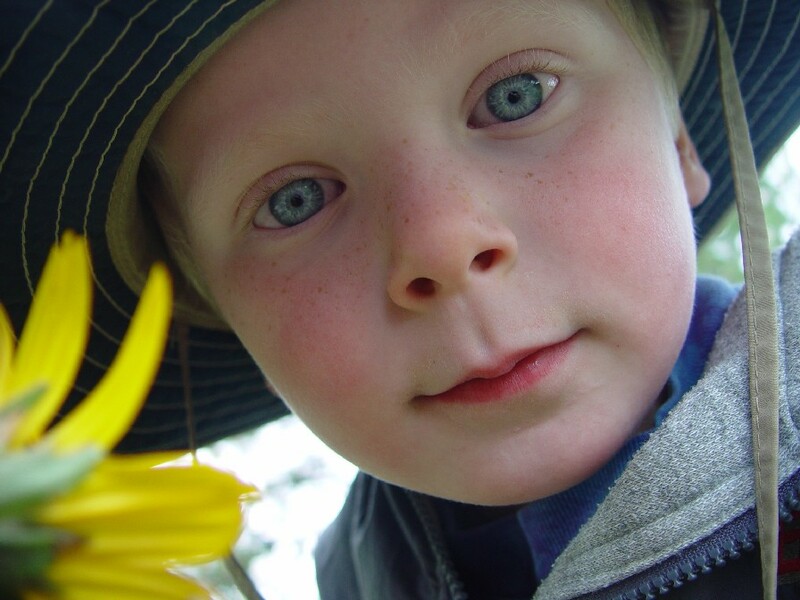 Here's four-year-old little shmoo (back when he was still a little shmoo), on a summer campout. Shmoo has always been an enthusiastic hiker, camper, and traveler, and tomorrow we're heading out on another Big Adventure! If your family is planning some vacation and travel adventures this summer, you might want to check out the article I wrote recently for kidscantravel.com: Eating Vegan on the Road. The article had to be brief, but I really wanted to say a bit more about the link I included to Mary Jane's Farm. Her organic instant meal packets were a revelation to us on our last campout. Do a search on the word "vegan" and you'll see they have quite a selection (including brownies!). We loved the Couscous & Lentil Curry, Velvety Black Bean Soup, Black Bean Hummus, and Pinto Bean Flakes. Happy summer holidays, everyone, and if your plans include a sing-along around a roaring campfire, don't forget the vegan marshmallows! Wow -- over 400 comments on the last post! Unbelievable! Thank you all for your votes, comments, and suggestions on which cover to choose for Vegan Lunch Box ("The Book"). Extra-special thank yous to all the book designers and stylists who emailed me with suggestions, mock-ups, and new ideas -- your advice has really made a difference! We've used a combination of your votes along with some of the new ideas we've received to come up with the final cover. Sadly, we are nixing the stripes (sorry, stripe lovers!) and will be giving Contestant #1 a final makeover before her big debut. Stay tuned! Right now, both covers are tied neck-and-neck here in the McCann household. Hubby is cheering for one, I am strictly a fan of the other. I'm not telling which is which, so as not to influence your opinion in any way. Please help us decide by using the comments to let us know which cover reigns supreme, and which one belongs on the scrap heap. Thanks! Leonard over at Crummy has created something I don't think is crummy at all: a Mystery Loaf Generator that uses the Magical Loaf Studio to generate and name a brand new loaf every five minutes. The amazing thing is, every loaf I've seen so far actually sounds good! Now, as Leonard says, "you'll never be loaflorn" again. 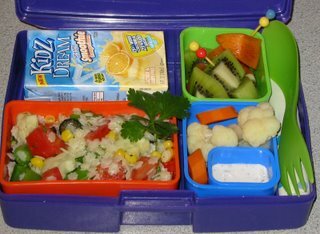 Vegan Lunch Box Wins VegWebby! "Jennifer McCann's Vegan Lunch Box defies the deprived-vegan-child stereotype. Enthused web prowlers have been brewing up buzz about this blog since its inception in 2005. The premise? 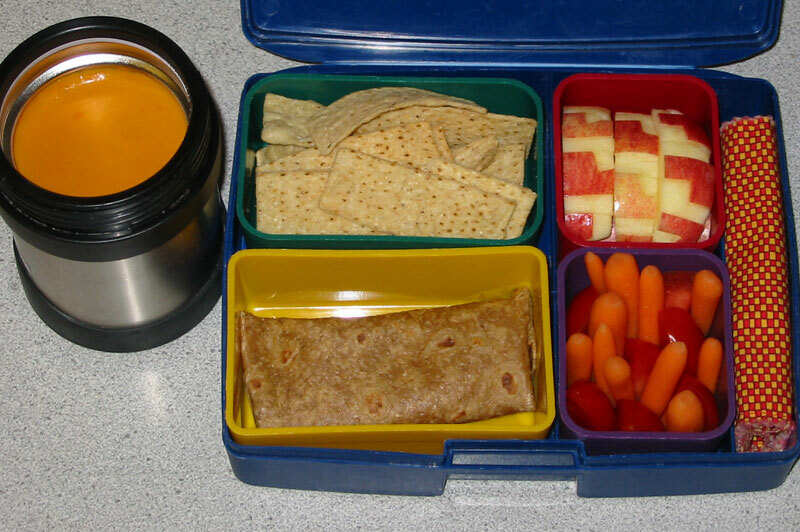 McCann chronicles and photographs her son Shmoo's daily lunchbox gems. With her aloo samosas, empanadas and phyllo bundles, she could well be raising the best-fed kid on the planet." Hee hee. As a VegNews lover from waaay back (I take my VegNews canvas bag with me whenever I go shopping! ), I am so surprised and delighted by this honor. Thanks so much, VegNews -- your magazine is the BEST! I hope everyone is having as much fun this summer as we are! Summertime here is hot, hot, hot, and filled with activities. We've been zipping off each day to one fun thing after another -- swimming, park days, play dates, and bumper boats! Last weekend I even hosted a sushi party (first two pics), where I demonstrated the fine art of rolling sushi (filled with vegan goodies like tofu, peppers, avocado, mango, and cucumber, of course!). And here's a photo of our latest Power Picnic: first, a giant salad made with romaine, spinach, pear, fresh figs, and walnuts, with a little container of D'Anjou Pear Vinegar (shmoo was going to pack an extra pear for himself, but ended up eating it on the spot instead). For the shmoo there's a cashew butter and homemade rhubarb jam sandwich on cracked wheat, surrounding a pyramid of baby carrots. For me, a thermos filled with red lentils, beets, carrots, and my beloved kale. Verdict: I'm learning that shmoo is usually too busy having fun to really stop and eat when we're on our picnics, but he did manage to finish all his sandwich and ate his carrots on the way home. I'm learning I can always keep my daily salads interesting and heighten shmoo-appeal by adding different fruits and nuts and flavored vinegars; pears and figs was a great combination. 4 stars.